The more you can make your child’s hospital stay like home, the better your child will adapt and recover. For green families, this means bringing green products to the hospital and carrying out any recycling. Just like when going into the wilderness, the green hospital stay follows the credo “if you pack it in, you pack it out” (with the exception of medical waste!). If you can’t bring these items or know in advance what you might need, find the closest health food store or coop to the hospital, and ask a friend or relative to run an errand for you. By greening your family’s hospital stay, you will alleviate one less stress during these difficult times. Great tips. Thank You. You have given me a lot to think about for my upcoming hospital stay. I am keeping your son and family in my prayers. Wow, Jennifer. You are fantastic. More and more moms and dads look for thoughtful and informative blogs to help them in making healthy decisions for their little ones. Yours has gone above and beyond, helping parents green an atmosphere that should (for all intents and purposes) already be that way, but in truth, is a far cry. Thank you for your amazing and incredibly helpful post. We’ll certainly refer expectant parents to your blog. I’m impressed you still got a homebirth. 🙂 Or were you not aware of the heart defect before birth? Most midwives refuse anything remotely “risky”. Or maybe that’s just midwives in my area. No, we didn’t know ahead of time about the heart defect. It could have been seen on a level 2 ultrasound, but we didn’t have any ultrasounds and there no signs that one was needed. 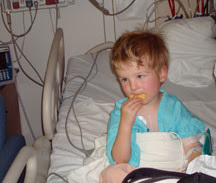 I am so thankful he didn’t need immediate surgery after birth, and it all worked out. and one more comment about midwives…..my midwives were amazing. They supported us throughout it all. They offered to spend the night with us the first night he was born. They attended weekly doctor appointments with me and an echocardiogram at a local hospital. They never left our side throughout it all, short of traveling 6 hours to UCSF with us, but they called often. What a great and informative post! Thanks so much for your input. My wife will tell her expecting friends. All the best to you and your family!